Young Mayo artist, Hetty Lawlor from Kilmeena, a 17-year old student in Sacred Heart School, Westport, has been chosen as overall winner of this year's 64th Texaco Children's Art Competition taking first prize in the senior 16-18 years age category. 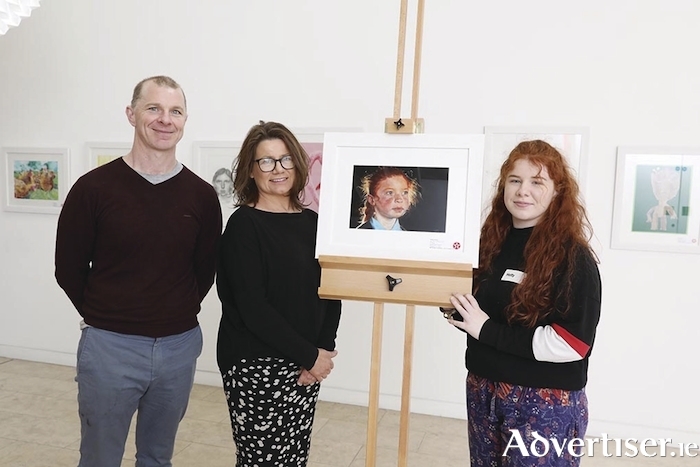 Her winning entry – a portrait study of a young neighbour entitled ‘Gráinne’, which she completed in acrylic and colour pencil – was described by competition adjudicators as ‘a captivating portrait, beautifully composed, perfectly executed and life-like in its use of colour, tone and texture’. From an artistic family – her father Jimmy is an artist, her mother Phyl designs carpets and rugs, and her sister Anna studies animation at college in Dun Laoghaire – Hetty is familiar to television viewers here and overseas thanks to her participation in the recent Sky Arts Portrait Artist of the Year competition and her subsequent appearance on the Ray D’Arcy Show on RTÉ One. Said by her mother to have been "over the moon" with her success, Hetty expressed her "amazement" at having been chosen overall winner, adding: "Knowing of the many renowned and highly talented artists who have won prizes in the competition down through the years, I feel hugely honoured to be amongst them." Having been "trying for years" to achieve overall victory – she was a prize winner on three occasions previously, winning a Special Merit award in 2015, 2016, and 2017 – Hetty was inspired by her father Jimmy and his success as a 16-year-old student when, in 1984, he too won the overall first prize in the competition. "His support, and the hope that I could follow in his footsteps, is one of the main reasons why I persisted in entering the competition," Hetty said. Describing Hetty as "an exceptional talent", the chairman of the judging panel, Professor Declan McGonagle, said: "she is the latest in a generation of young prize winners whose work is testament to the depth of artistic ability existing in Ireland today and an illustration of the very high standard of entries being submitted in the Texaco Children’s Art Competition." In winning the coveted first prize, she fought off competition from thousands of young students across Ireland who took part in the competition. She will be presented with her prize at a ceremony to be held in the Royal Hospital Kilmainham next month, when all of the 126 winners, from seven categories, will be in attendance. Planning to pursue third-level studies in art, Hetty’s prize will include a cheque for €1,500 plus a visit to Tokyo in August at the invitation of the International Foundation for Arts and Culture. There she will be guest at the 19th International High School Arts Festival in which her winning artwork will be exhibited at the National Arts Centre.